Welding is a process that joins two materials by melting the pieces and adding a filler material to form a strong joint when cooled. More specifically, arc welding maintains an electric arc between an electrode and the material to melt it at the welding point. There are more than 80 different types of welding. Some of the most common include shielded metal arc welding (SMAW) or stick welding, gas metal arc welding (GMAW) or MIG welding, and gas tungsten arc welding (GTAW) or TIG, plasma arc welding, and submerged arc welding (SAW). Each type of welding processes is hazardous for many reasons, albeit some more than others; a major reason are the particles and gases that create adverse side affects after inhalation. The major source of these particles is welding smoke or fume. 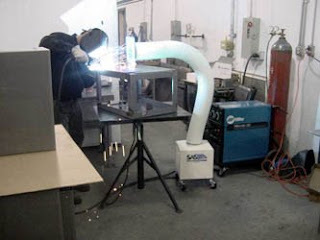 Smoke can be defined as a suspension of solid particles in a gas and more specifically “fume” is used among aerosol scientists “to describe any airborne metal or metal oxide particles that condense from vapor.” This is precisely what happens when the metal is heated up rapidly during welding. Part of the metal is vaporized at the extreme temperature and then quickly cools and condenses into sub-micron particles in the airstream. Another significant concentration of welding particulate in the airstream comes from what is known as welding microspatter. These are liquid droplets that are small enough to remain airborne. There are many hazardous substances in welding smoke. Most are the very fine, respirable particles of many types of metals, including chromium, nickel, arsenic, asbestos, manganese, silica, beryllium, cadmium, cobalt, copper, lead, and zinc There are also many others which can all be extremely toxic. Manganese containing fumes is one of the biggest risks encountered in welding smoke. Inhalation of the metal can cause serious damage to the brain and nervous system. Manganese fumes can result in the onset of Parkinson’s disease, a crippling disorder that affects movement and balance. It also causes “manganism,” which is closely related to Parkinson’s as it makes it difficult to move properly. Iron oxide can also be contained in the welding fumes, which is very irritating to the respiratory system. There is also cadmium which is used to coat the metals, which can cause lung disease, emphysema, and kidney failure. Other harmful substances include lead oxides and asbestos. Welding fume exposure can lead to wide variety of health hazards, which include harm to the lungs, heart, kidneys and nervous system. These health effects may be both short term and long term. The table below shows some of the short-term and long-term health effects resulting from welding fumes. 1. Exposure to metal fumes may cause metal fume fever. Onset of symptoms may occur 4-12 hrs after exposure and include chills, thirst, fever, muscle ache, chest soreness, coughing, wheezing, fatigue, and nausea. 3. Some components of welding fumes, such as cadmium, can be fatal in a short time. Additionally, some gases that are deadly at high levels, like nitrogen oxides and ozone, can form during welding. Phosgene is another deadly gas that has been known to form. 1. 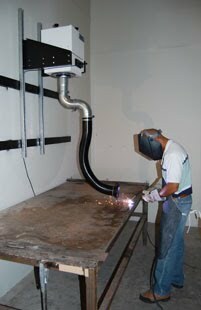 Welders face an increased risk of lung cancer, cancer of the larynx and urinary tract. 2. Chronic respiratory problems including bronchitis, asthma, pneumonia, emphysema, pneumoconiosis, decreased lung capacity, silicosis, and siderosis. 3. Other problems related to welding include: heart disease, skin diseases, gastritis, gastrodduodenitis, kidney damage, and ulcers. 4. Reproductive problems (delayed contraception and increased miscarriages) have also been discovered among welders, especially those working with stainless steel. Metal particles are not the only toxic substances that can result from welding. Often times the base metal is coated with paints or coatings. These coatings contain highly toxic chemicals that can be evaporated and inhaled. Other fumes and gases can come from fluxes in the electrode, from shielding gases, and from various cleansing agents and solvents. These all must be recognized and controlled for. Some of these gases are vapors and as such cannot be filtered by a particulate filter. In “Particle Size Distribution of Gas Metal and Flux Cored Arc Welding Fumes” from the October 2005 edition of Welding Research, the authors discuss the concentration of submicron particles and their hazardous effect on human operators. They state that welding particles smaller than 20 microns can remain airborne. However, only those smaller than 1 micron are truly dangerous and can be deposited in the lungs as those greater “in size are trapped on the walls of the human airway before they reach the lungs. They are carried away in the mucus…” They further state that “only about 30% of particles (between 0.1 and 1 micron) eventually deposit in the lungs. Noting the inherent hazard of particle deposition in the lungs, the researches measured the size distribution of particles to find out the respirable fraction. They concluded that greater than 75% of all particles were less than 0.4 microns in size in MIG welding and greater than 90% of all particles were less than 0.7 microns in size. This differs from the 50% and 70% for flux cored arc welding. Clearly, most of the particles in the welding smoke are respirable. Given that the vast majority of the respirable particles in the airstream are under .4 microns in size, a filtered ventilation system that can filter down to that level is needed. When choosing an adequate ventilation system, make sure that you gather sufficient information about the filter performance. There are several filters that claim 99% efficiency, but fail to divulge at what particle size the filters achieve this efficiency. An efficiency of 99% at 1 micron is not the same as a 99% efficiency at .3 microns, nor is it comparable to even 90% efficiency at .3 microns. Remember that the smaller particles are more respirable and must be filtered out to reduce the possibility of health effects. For stationary welding applications. The model 300 Sky Sentry offers an easy to maneuver, operator friendly, self-supportive flex arm. A variety of filter combinations including HEPA and activated carbon filters are available. For applications that require a self-supportive, portable welding fume extractor. For applications that require a highly portable system. Flex ranges from 12’-22’. The Python Sentry is best used in hard to reach applications where a long hose is needed. The Python Arm is designed with flame retardant hose material and a magnetic capture hood with handle. 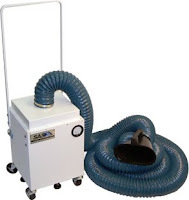 For more information on Fume Extractors from Sentry Air Systems please click here, or call Sentry Air Systems directly at 1-800-799-4609.